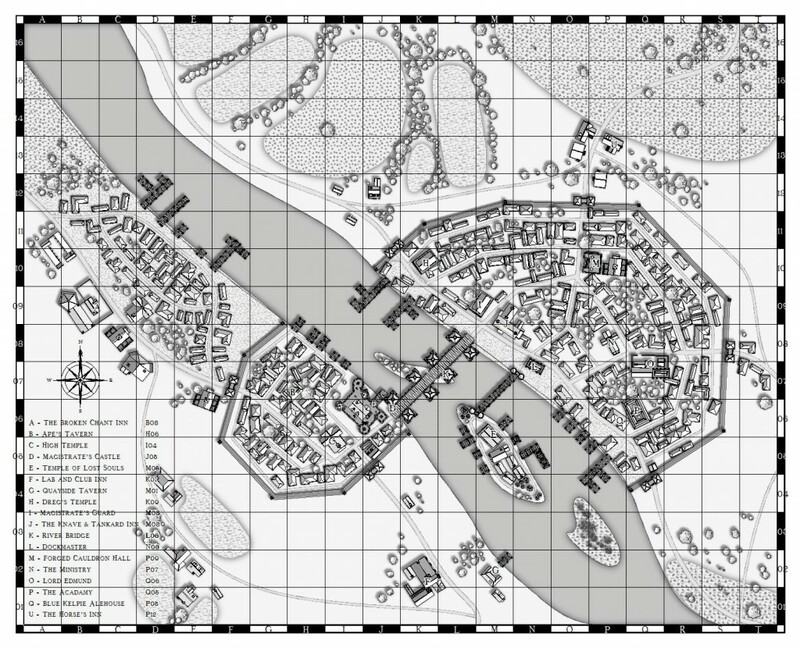 This is our first Guest Post on FreeFantasyMaps.org – it’s a map of the town of Megetrs, by Nick Pelletier. Thanks Nick for sharing your map with us! This smallish sized town was originally just a fjord left under the control of an ambitious young magistrate. He quickly realized that the geography gave a unique location to become a traffic hub both from land and water traffic. He had a bridge built and enough quays that prevented larger ships from going any further up river or large river boats from going down river. As a result, all cargo had to land, unload, go through the town and be reloaded on the other side. This quickly became a hugely successful business venture (which the Magistrate owned major interest). Before too long, the Magistrate was able to build himself a full fledged castle despite being common-born. The city grew fast and so did the Magistrate’s wealth. Walls were built in order that the magistrate could control who came and went from the city. The island in the middle of the river was designated for unauthorized traffic. Anyone new arriving to the city had to first be subject to rigorous ‘inspection’ before being allowed off the island and into the city. Many ‘undesirables’ found it easier to just catch a ride on another boat than attempt entrance to the city. Commoner Harbour, to the north became a small town in it’s own right. Lawless and uncontrolled outside of the strong city walls. Hi there Nick. Nice work on the town map. I was wondering how you created it. Did you use any professional mapping software, freeware, or just wing it with something else? How long did it take you to make the map? Hope you don’t mind the questions. I am thinking of trying to design a few cities of my own and am very interested in hearing from you. Just gotta ask, what programming software did you use to make this map?